It's FREE & EASY - No fees or membership charges, and no pesky card to carry! Simply present your name to any of our cashiers prior to making your purchase and we will keep track of your frequent buyer club purchases and points being earned towards loyalty dollars. Exclusive Offers: Take advantage of sale pricing & instant rebates exclusive to Loyalty Rewards members. Program members should provide email address, follow us on Facebook, and/or visit our website frequently for announcements and current promotions. Frequent Buyer Clubs: Earn coupons and free product from the brands you already buy! Details vary by category and brand, see store for details. Frequent Buyer club balances expire after 14 months per manufacturer requirements. Loyalty Dollars: Earn a $5.00 COUPON for every $250 you spend (pre-tax)* per calendar quarter. Coupons will be automatically generated at the cash register and may be used on any future purchase. Coupons are like cash and cannot be tracked or replaced should you lose them. Coupons have no cash value and must be redeemed in their entirety. They may not be used towards sales tax. All coupons are valid for 60-days from date of issue. *Weber Grills & Home Heating product purchases are excluded from this program. IMPORTANT: Ellington Agway Power Equipment is an independent subsidiary of Ellington Agway, and therefore does not participate in this program. Equipment, Parts, and Service purchases do not accrue rewards, nor may coupons be redeemed on such. We appreciate your business and want to reward you for shopping with us. 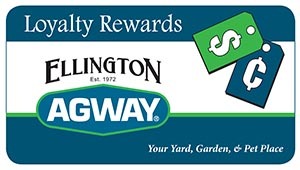 Ellington Agway offers a Loyalty Rewards account to any customer that shops in our store. Simply present your name to any of our cashiers prior to making your purchase and we will keep track of your frequent buyer club purchases and points being earned towards loyalty dollars. Click these links to learn more about the Loyalty Rewards program, and our Pet Food, Bird Food, Salt Frequent Buyer Clubs, and Propane Rewards. Please use the form below to sign-up! Note, it may take up to 24-hours for your account to be live in our system. Program members should provide email address, follow us on Facebook, and/or visit our website frequently for announcements and current promotions. Participants are responsible for notifying Ellington Agway of any change in contact info. Commercial accounts, landscapers, contractors, stables and other "wholesale" accounts do not qualify for this program. IMPORTANT: Ellington Agway Power Equipment is an independent subsidiary of Ellington Agway, and therefore does not participate in this program. Equipment, Parts, and Service purchases do not accrue rewards, nor may coupons be redeemed on such. Ellington Agway reserves the right to change or cancel this program at any time.